Published December 31, 2013 at 400 × 266 in Farmers Bridge Flight. May I commend you, Sir, on the uncanny parallelism regarding your own observations about the River Styx and my own thoughts appertaining to Farmers (sic) Bridge Flight. I was recently on holiday in that ancient land which is today known as Turkey, and one evening I sat in a quiet little bar that fortuitously faced the placid waters of the Mediterranean, affording a delightsome view of the moonlit ocean, and while there shielded in my private mental cocoon of fanciful imaginings, far away from the crowds of Marmaris (I was in Icmeler, about 7 km away), I accessed the interweb using my iPhone device (bought for me by my great grand niece who is studying Law at Loughborough University), and within a short time I had accessed Mr Grimes’s truly delightsome website. I soon proceeded to feast my eyes upon the images exhibited throughout, all as I sat there in the sweltering Mediterranean heat. I was drawn to this image in particular, perhaps because of its unusual delicacy and transcendent lighting, or perhaps because of some other reason that I am unable (or just don’t want to) put into language. Whatever the case, I was, to use your delightful phrase, Sir, “caught in the headlamps” of sterling creativity (please note that “sterling creativity” (c) is my own phrase and not yours). It was as if the great legends of the past were quickened before me and merged into some delightful mythological Greek Salad, that is to say a fascinating blend of heroes and and demigods that danced before my very eyes! The Pillars of Hercules jutting in stately and gigantic form right out from the midst of the River Styx, and the boatman’s unearthly presence is almost certainly suggested by certain ripples that flutter back and forth across the well nigh quiescent pool (I know my legends are somewhat mixed in together, but I’m sure that is what the photographer intended anyway); then something flew out the page of the screen at me like a nocturnal bat that later that evening would nearly smash into my face as I walked home (a curious adumbration that I thought you would appreciate! )- it was the unmistakable suggestion of the Colossus of Rhodes. Can you see it I wonder? For me it was so plainly represented by the lock that spans the two parallel sides of the canal, just as the ancient wonder’s legs would have spanned an area of plinth upon which it stood betwixt its two legs. Interestingly, it appeared to me later that evening, that the body of the Colossus is represented quite clearly by the towering tower (perhaps flats or apartments?) that thrust up rocket like into the sky in the background. Time would fail me if I were to mention ‘the path of the gods’ (I just have), and the ‘ladder to heaven’, which of course can’t be seen but is undeniably suggested by the topmost aspect’s being visible wherein it curves down into the underworld of Hades (the canal). I hope you find a measure of interest in my observations just as I have in yours. I look forward to your further comments on the photographer’s works of art. Great to know that Warwick is flying the flag when it comes to talented photographers! Having ploughed my way through countless pictures on many an amateur photography site, I can tell you that none are so consistently impressive as those appearing in this online portfolio. It’s not just the professionalism and the artistic vision that you bring to these images, there’s also the fascinating historical information that is provided for each picture. You really have gone the extra mile; a fact that is evidently appreciated by your loyal band of followers. For those interested in our industrial heritage, especially the canal system, this site represents a defiant outpost against the ravages of modernity. Farmers Bridge locks is a wonderful example of hidden beauty and the woeful neglect of hidden landscapes. There are very few practitioners who could animate such a seemingly unremarkable scene so skillfully and arouse so much emotion in the process. 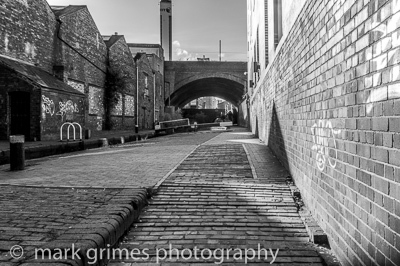 If I may be so bold, I would describe you as the canal ‘Banksy’ of the industrial inheritance photography scene. Worth reflecting on for anyone who would casually survey the magnificent offerings on this site, without seeking deeper insights. This isn’t simply ‘photography’-this is the inner vision of a great artist. A friend of mine mentioned to me recently how very few ‘exceptionally talented’ people there are today, compared to other eras of history. Regardless of the field of human endeavour, whether it be in the arts, music, football, etc., it really does seem that the days of the towering genius are behind us. Whilst I agreed with the general thrust of his observation, I happened to mention that there have always been the unsung heroes, particularly in artistic endeavour, who, whilst they may not get national coverage, are still greatly appreciated and lauded by their discerning followers. I cited Mr Grimes as a case in point: without doubt a supremely talented photographer, with a loyal and discriminating fanbase, but perhaps not widely known in his field of expertise. As lamentable as this lack of wider recognition may be, it does engender a certain pride among those who are aware of his work, as though they belong to an exclusive club. Indeed, a photographer friend of mine, who is a keen admirer of the Grimes style, expressed the view that the term ‘Grimsian’ may very well enter the photography lexicon at some future point. He believes that Mr Grimes has pioneered a style of image construction that can be compared to the impressionist painters, pointing out how his deeply expressive depictions are characterised by their precise portrayal of light, and an incredible use of angles. We need only look at this little gem to illustrate these points. There is breathtaking detail here, and the whole picture is really a textbook lesson in composition. The lighting manifests in such a way as to maximise the effect of the beautifully rendered brickwork, and powerfully accentuates the dramatic shadows. As for the angles, I don’t think I’ve seen a more tightly constructed use of landscape; it’s both expansive and yet strangely contracted. The eye is tricked into an almost hypnotic progression, as it takes the inexorable visual highway to the vanishing point beyond the bridge. My friend may indeed have a point about the lack of real talent in this modern era, but perhaps if we turn our attention away from our most celebrated (and hyped!) cultural icons, we may very well discover an alternative stream of truly gifted individuals…Quod Erat Demonstrandum!